Here you can find all The Northwest Passsage press clippings we've accumulated over the years. The Northwest Passage's Rick Sweitzer announces the formation of the KILI Fund to aid unemployed and underemployed local porters who assist Kilimanjaro mountain expeditions by providing paid sponsorship for trash removal from the slopes of Mount Kilimanjaro. Rick Sweitzer of The Northwest Passage has been kayaking in Greece for almost 25 years, and heads "the largest kayak outfitter in the Greek islands." Polar Explorers offers thrilling adventures to the North Pole. Experienced guides will show you the ropes during the "Devil's Lake: Rock Climbing & Hiking" adventure offered by Wilmette-based Northwest Passage. Northwest Passage participates in Chicago Park District's Polar Days. Northwest Passage offers sea kayaking trips to many midwest destinations. Northwest Passage offers demonstrations on preparing for an arctic expedition. 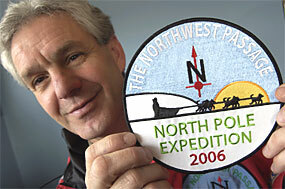 Polar Explorers offers North Pole Expeditions for the adventurous! Scout Turkey's dramatic Mediterranean shoreline from the cockpit of a sea kayak on this eight-day multisport adventure with the Northwest Passage, named one of Outside Magazine's "40 New Trips of a Lifetime".